Moscow (AsiaNews) - The Synod of the Moscow Patriarchate declares that it is impossible to maintain Eucharistic communion with the Orthodox Church of Constantinople. This was announced by the patriarchal synod gathered yesterday in plenary session in Minsk in Belarus. Also present at the Synod was Metropolitan Onufrij of Kiev, head of the Ukrainian Orthodox jurisdiction loyal to Moscow. 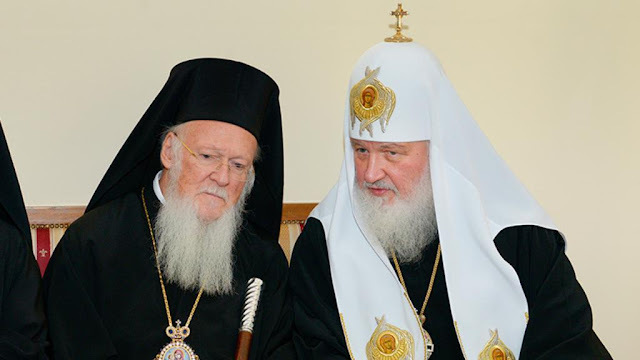 According to Metropolitan Ilarion (Alfeev), the Russian bishops consider the decision to break communion with Constantinople “a forced” one, the result of "the recent actions of the Patriarchate of Constantinople". The decision means that the priests of the patriarchate of Moscow will no longer be able to celebrate the liturgy together with the representatives of the ecumenical patriarchate, including the churches of the monasteries of Mount Athos, where monks of the two Churches now in conflict are often present in the same community. However, Russia is determined to defend the rights of its nationals in every circumstance and in every country, Peskov recalled, even in the case of possible confiscation of the properties of the Russian Orthodox Church in Ukraine. In recent days, some statements by Ukrainian President Petro Poroshenko have thrown more fuel on.